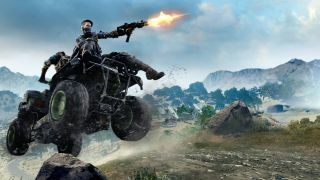 The closed beta for Blackout, Call of Duty: Black Ops 4’s ambitious new battle royale mode, took place last August, during which thousands of players put the game through its paces with countless fights to the death across the biggest map in Call of Duty history. The beta was a huge success for Treyarch, and not just in terms of player count, as the response from fans and newcomers has been hugely positive. Since then, the studio has been able use the feedback received from the Blackout beta to inform those all important last minute tweaks before Black Ops 4 launches, though Studio Design Director David Vonderhaar admits being pleasantly surprised by the breadth of creativity on the display from players. Even throughout the beta itself, Treyarch implemented a host of rapidfire changes to adapt to player’s emerging requests and queries, reworking the armour system, streamlining inventory management, and speeding up the item pickup controls for faster on-the-fly scavenging. Vonderhaar promises that this commitment to reactively fine tuning Blackout will continue long after Black Ops 4 launches, too, allowing the mode to evolve and permutate with every passing week and month, well into its future as an online experience. Within just the short space of time for which the beta was live, Treyarch reported that players had killed over 7.5 million zombies, revived 26 million squadmates, and picked up 3.3 billion items, among other things. Meanwhile, 123 people were unlucky enough to be killed by a basketball, one of Blackout’s many secret quirks and easter eggs found across its expansive map. It’s a promising start for a mode which pulses with potential, especially now that Treyarch has proven its intent to iterate and evolve Blackout over Black Ops 4’s lifespan. In short, watch this space: you’re about to see a lot more basketball related fatalities in the coming weeks and months.